You can generate static electricity on a simple level by rubbing certain materials together. Rubbing a cloth on a plastic rod is a good example of this. However, there are devices that can generate static electricity that can then be used in applications, demonstrations and experiments. The electrophorus uses electrostatic induction to repeatedly charge a metal plate. The Wimshurst Electrostatic Generator uses rotating plastic plates and wire brushes to generate static electricity and is used in many schools. The Van de Graaff Generator uses a high-speed belt to create high power static electricity, sufficient to shoot sparks, cause the hair on your head to rise and light fluorescent bulbs. How does the Wimshurst Electrostatic Generator work? How does the Van de Graaff Generator work? An electrophorus is a clever device that combines simple creation of static electricity along with electrostatic induction to repeatedly charge a metal plate. It was invented in the 1764 by Swedish professor Johan Carl Wilcke and improved a few years later by Italian scientist Alessandro Volta. The way it works is that you first create static electricity charges on a plate or disk made of a dielectric or non-conducting material, such as plastic, by rubbing it with wool, cloth or fur. Then you place a metal plate into contact with the charged non-conducting plate. The static electric charges on the nonconductor draw opposite charges to the surface of the metal plate through electrostatic induction. In other words, negative (−) charges on the nonconductor cause positive (+) charges to gather on the metal plate. When you pull the plates apart, the metal plate has static electric charges which can then be used to create sparks or demonstrate static electricity. Once the charges in the metal plate are depleted, it can be recharged by putting it in contact with the nonconductor or dielectric plate again. This process can be repeated many times before the charges on the dielectric are all gone. The Wimshurst electrostatic generator was invented in the 1880s. The modern version consists of two plastic discs that are rotated in opposite directions by a hand-crank and drive belt mechanism. The brushes also are connected to spark gap electrodes. 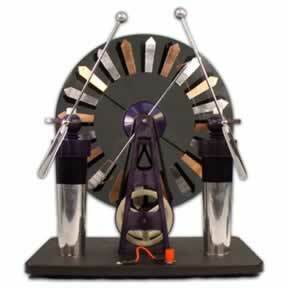 As the discs revolve, a high voltage spark can jump between the electrodes if they are gradually brought together. The Wimshurst electrostatic generator can generate up to 75,000 volts. Since the current is very low, there is little danger from the high voltage, but yet it is effective for creating sparks and performing interesting static electricity experiments. The Van de Graaff generator can develop potential energy of as high as 400,000 volts, and it will develop sparks up to 15 inches (38 centimeters) in length. It is relatively safe to use though, since the current is only 10 microamps (10/1,000,000 amps). This is because electrical power equals the voltage times the amperage. 400,000 volts times 10 microamps equal only 4 wattsthe energy to light a flashlight bulb. The Van de Graaff generator is powered by a high speed electric motor. It has a belt running on two pulleys. The lower pulley is made of an insulating material and the upper pulley is made of metal. There is a grounded comb close to the belt in front of the lower pulley, and another inside the terminal, close to the belt in front of the upper pulley, connected to the terminal. Adhesion between the belt and the lower pulley charges the pulley, and it attracts opposite charges to the outer surface of the belt from the grounded comb. The belt then transports these charges to the terminal, where they are collected by the upper comb and transferred to the terminal. The shielding provided by the terminal allows the continuation of the process even if the terminal is already strongly charged. The high speed of the belt, along with the large discharge electrode, allows the continuous buildup of charges and great voltages to be achieved. The Van de Graaff generator in the picture is about 35 inches (90 cm) high. Some scientific laboratories have such generators several stories high. They can develop sparks that go all the way across the room. But still that doesn't compare to the power of lightning, which can be several miles long. The electrophorus, Wimshurst and Van de Graaff generators are good sources for generating static electricity. The electrophorus can repeatedly charge a metal plate. 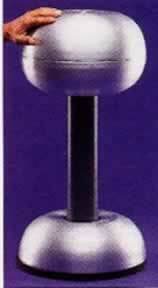 The Wimshurst and Van de Graaff generators use high-speed nonconductors and brushes to create the static electricity. They can provide extremely high voltages, but since the current or amperage is very low, they are still safe to use.